Two days a week I have the pleasure of working with Captain Adam as my first mate. Captain Adam operates the drift fishing boat on a few of his other days. A few of his “regulars” decided to charter the boat for the day. Orlando and his crew showed up bright and early so Adam and I thought we’d give them a chance at a few things we do. Some trolling for Blackfin Tuna was our beginning as we headed out for deep drops with the electric reel. The Tuna were spotty at best and we made haste to get to our depth of 800’ of water. When you fish with 5 to 8 lbs. of lead? The electric reel sure makes things easy and after a couple of blank drops, the Black Bellied Rosies were biting! Being seasoned Drift fishing customers the guys were aching to be doing their own fishing with their own rods. Our first stop turned out to be our last and the bite was on! Vermillion and Lane Snappers were biting well. So were the Porgy’s and Triggerfish. The group was very comfortable baiting their own hooks, handling any tangles that occurred and hooking fish. We made 6 or 7 drifts across our spot and each time added to the collection which was filling the box. I caught some of the fishing action from the fly bridge with my phone. And Orlando was kind enough to arrange their catch for a photo back at the dock. All in all, we ended up limiting out on the Vermillions, had another dozen or so Lanes, 10 to 15 Triggers, a handful of Porgies and 15 Rosies. Not a bad day’s work drift fishing off Fort Lauderdale. We look forward to your return. One of the greatest parts of my job is taking kids fishing. Here off Fort Lauderdale so many families vacation here, we get all ages on board. The younger they are, the more excited they get. Today’s fishing report is about 2 half day trips. The one in the morning was all adult guys, the afternoon trip had kids. With somewhat dirty water and little current even catching bait has been a bit tough. This lack of current and unseasonably warm weather has our Sailfish still north of us so we’ve been relying on some trolling and deep wreck fishing to provide action. Grouper are out of season until May 1 so Cobia, Barracuda, Amberjack, various snapper and other species hang around these wrecks. We welcome any of these for action and fun. The light tackle makes things a challenge and the fight can be over 20 minutes at times. 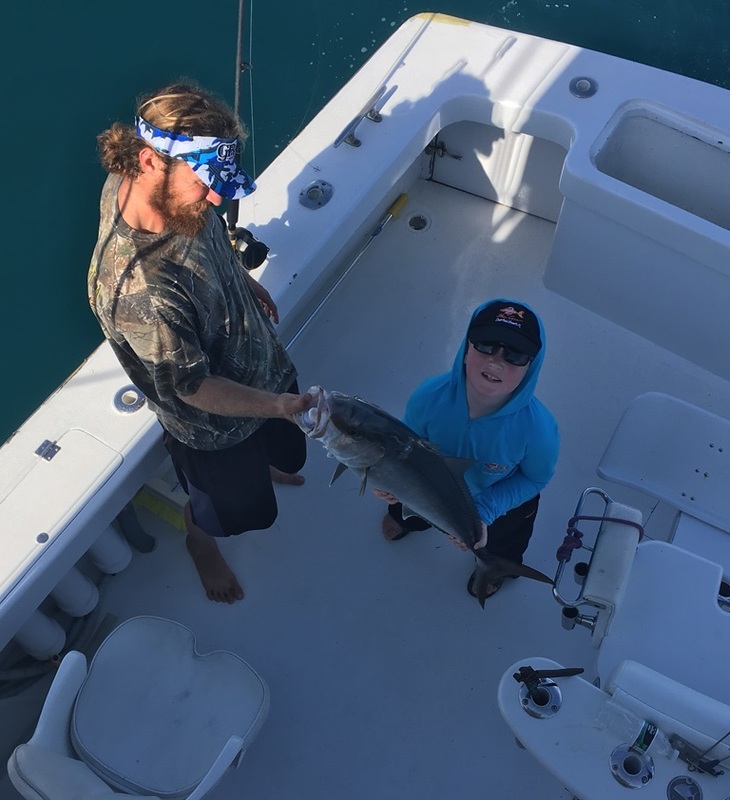 Our group in the morning did not have much fun reeling in the small baitfish we like to use but they did enjoy the Amberjack and two nice sized Barracudas we caught before time to head in. The guys did have a good time, it was absolutely beautiful out. But one fellow’s disappointment about not catching something good to eat kind of soured the mood. That happens sometimes on shared charters. Now we come to the trip with kids fishing. First off, catching the BAIT was exciting to them. I swear, I could have probably just done that for them, they were having a ball and keeping track of who caught more. Just reeling in the bug lines with 2 to 4 baits was tough for these kids and they got pictures taken of each one! One dad looked up at me as this went on and gave me a big smile and a thumbs up as the kids caught fish. And then we decided to play “Let’s make a deal”. You can keep the bait you caught or trade it in for what’s behind the surface of the sea. And this picture shows Christian with just what he caught, a fish almost as big as he is. With help from dad and Captain Adam as mate, the 20+ minute battle was done. His trophy had been boated, measured, tagged and released after photos were taken. So expect what you wish and be happy with what you catch. Something you always get when you take kids fishing. 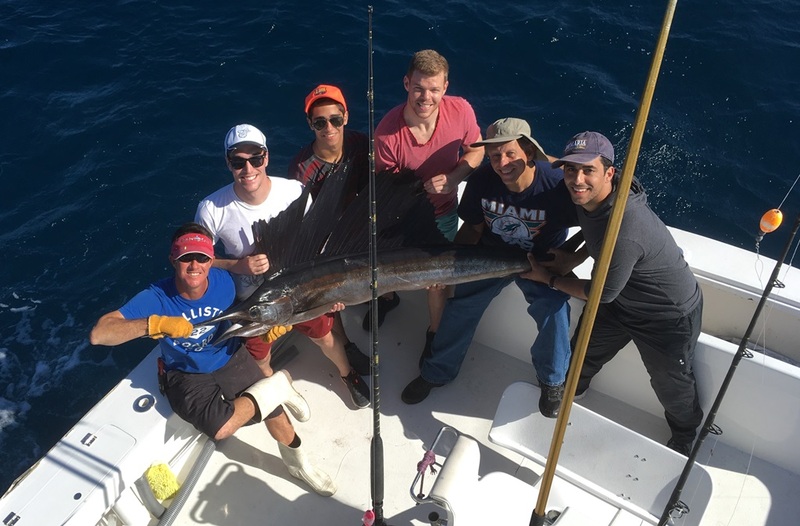 As we begin the New Year I always look forward to Fort Lauderdale Sailfish fishing. It is one of our most exciting fish to catch just a mile or two off our coast. 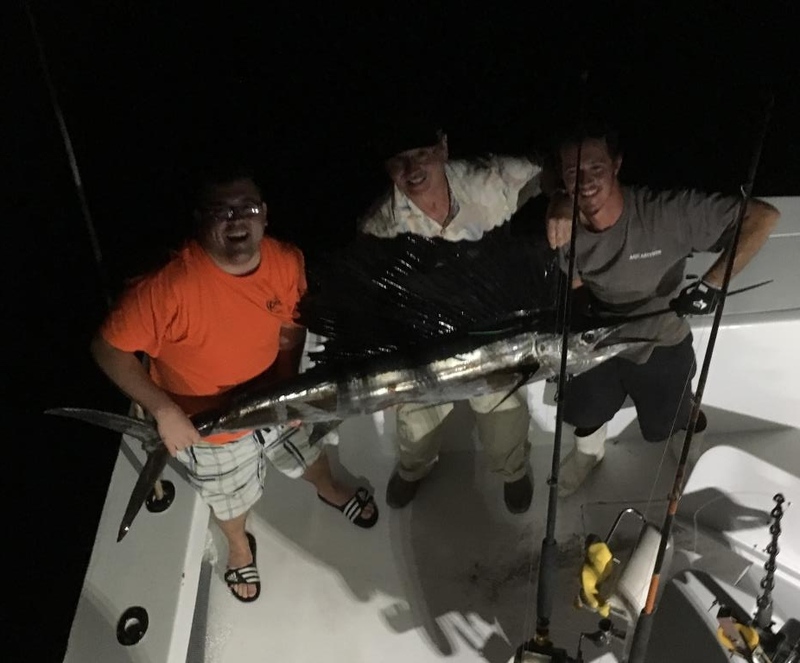 While we can catch Sailfish year round in any month, it is at this time of year we target them. 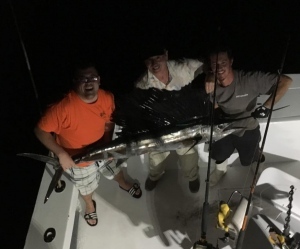 They migrate through our coastal area heading south and if you’ve never caught a billfish? You’re in for a real treat! From now until May, live bait will be the most productive, usually presented in kite fishing. Kite fishing usually allows you to “see the bite” as the fish approaches the bait held on the surface. Sometimes their sail is up out of the water, other times just the bill slashing at the bait attracts your attention. And if the fish eats the bait? Patience is a true virtue. Don’t come tight too quickly or you will pull the bait from his mouth. A text book bite is the fish takes the bait and swims 10 to 20’ down and away. He will stop and at this point, he is adjusting the bait in his mouth so that he can swallow it head first. He may then swim another short distance and stop again. But once he begins his run with speed? You count to 3 and push up the drag. If you’re fishing circle hooks, there’s no need to “set the hook”. Just coming tight with the fish takes care of that. J hooks do require some winding and setting of the hook. And at this point? He’s either on or gone. Most sailfish jump when hooked but not all. There have been times we’ve fought a fish for 20 to 30 minutes before he presents himself. And if all goes well? You’ll have him boat side in 30 minutes or less. Don’t get anxious when he’s close, this is a critical time to play things smooth and easy. Give him some line if he needs it. 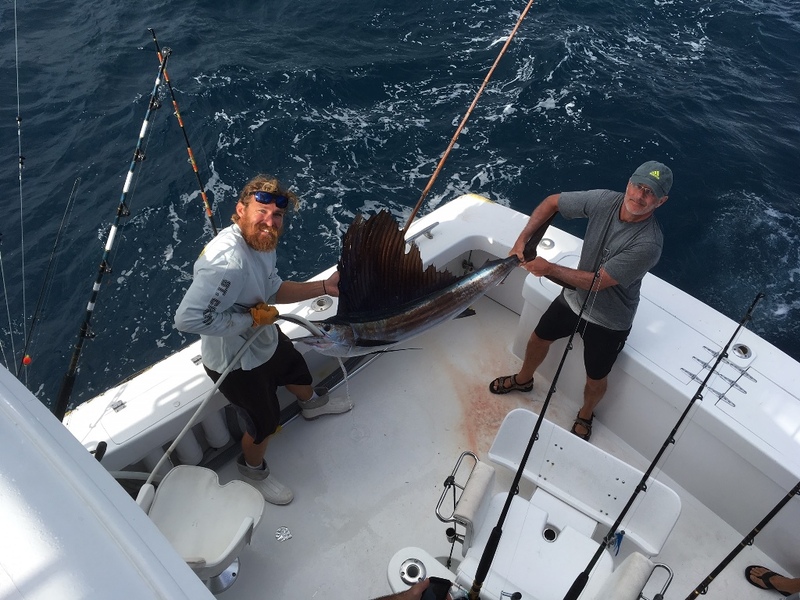 We release most Sailfish here in Fort Lauderdale. Even when you see a picture as I have here today, the fish was released and swam away. We have a tube that delivers salt water to the fish as we boat, measure, tag and photograph to keep him happy and healthy. And this way we can help our Fort Lauderdale Sailfish season be great year after year. Our last fishing charter trip of this year will happen sometime tomorrow. Christmas week, those days between Christmas and New Year’s, is always a busy week for us. This year the weather has been perfect, with little rain and mostly calm seas and sunny skies, which Fort Lauderdale is known for. I’ll be re-setting the boat’s trip log Sunday. This year we covered over 10,000 nautical miles while fishing. Considering our average speed is less than 5 knots, with most those miles either trolling or live baiting? Well, I thought it is kind of a neat fact, maybe you will too. You may have noticed that the picture for this report was taken in the dark. It happens quite often around sunset, a Sailfish will bite and it makes for a difficult fight. 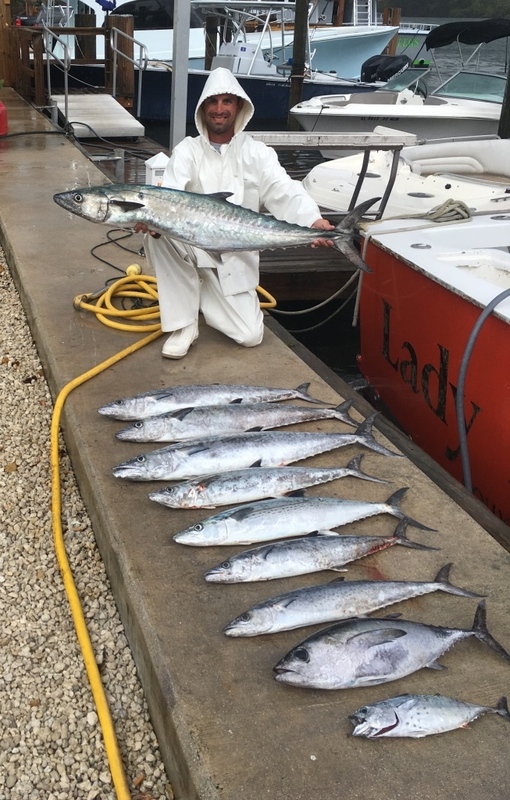 With almost no winds, we had opted for live Ballyhoo and small bullet Bonitos for live bait from the riggers. 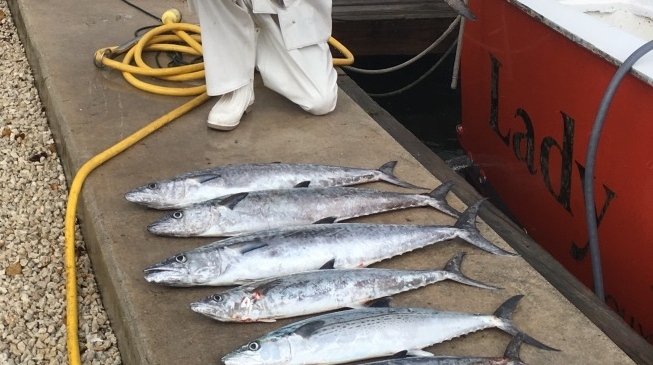 Blackfin Tuna and Kingfish were really our target. But when this fish bit? Opportunity met preparation and the game was on! The battle began with dad Mark in the chair. His son was video graphing the fight and this fish was angry and taking line. This became a family affair after a few minutes and the younger Mark took over. This fight went on for 45 minutes. We would gain some line and then the fish would take some away. Captain Adam was in the pit and as the light faded from sunset, his guidance of where the fish was helped me follow this fish. By the time we had the fish next to the boat? A flashlight was needed to help spot the fish so it could be boated, measured, tagged and released. Once the fish was taken off the salt water hose, we got a few pictures before reviving and releasing the fish. 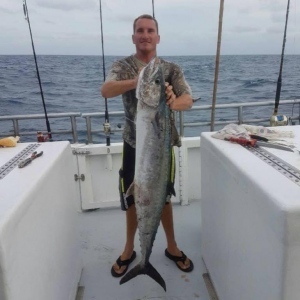 We at Fanntastic Fishing promote the tagging and release program on all our fishing charters. It protects the fisheries of these magnificent sport fish and we learn of the great distances they travel in migration. Have aa very safe and Happy New Year. With Christmas just a few days away the Holiday rush is nearly upon us. 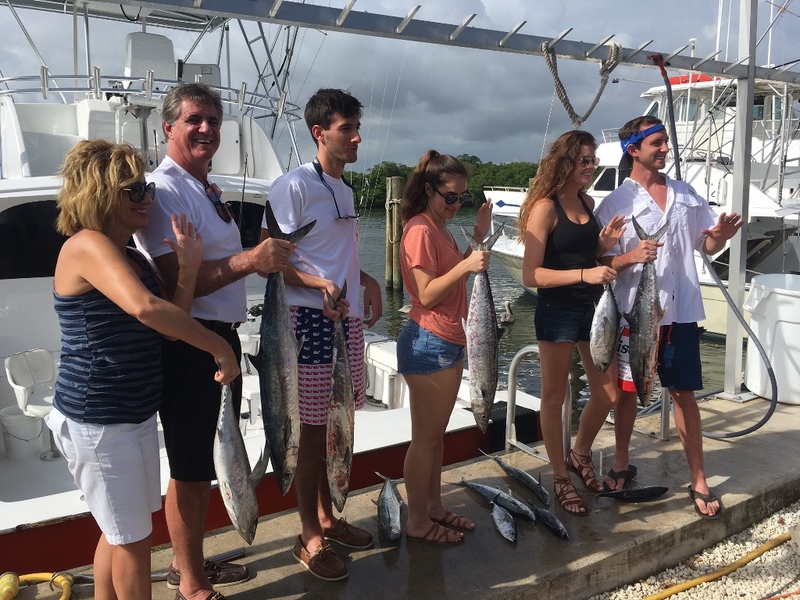 The week between Christmas and New Year is full of families visiting Fort Lauderdale and family fishing trips are most of what we do. The last few days have been just that, 2 days, 2 families and 2 very different results. Fishing reports are supposed to let you what’s going on, the trends, but this report will show what actually happens from day to day. Both Tuesday and Wednesday morning trips were family fishing trips. Both trips left at the same time, returned at the same time and were virtually fishing the same way in a close proximity of each other. 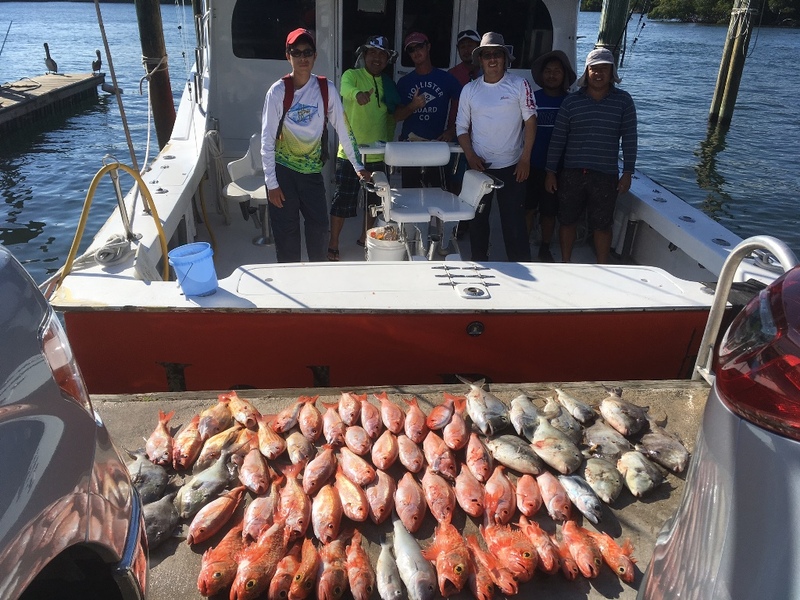 Our first group, which is pictured, had a ball on their trip catching fish. 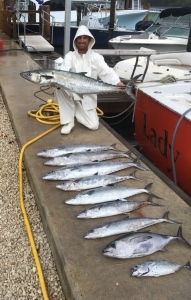 Kingfish and Blackfin Tune were abundant. We actually had trouble getting our full spread of trolling baits out without catching or missing a fish and this went on for about an hour. We simply could not get all our rods and lines in the water without having to stop to retrieve a fish or re-rig from missing one. While live baiting on this trip slowed the action, a few more nice sized Kings and missing a Sailfish was included. Rich and his family had a ball. With such success the day before our method didn’t change. Jeffery and his 3 boys were on time and ready. Our efforts proved almost fruitless. Other than baitfish, we just couldn’t seem to get a bite. Well, we did have 2 bites… One was an UFO… unknown fishy object. We never saw the fish and pulled the hooks about 40’ from the boat. We also had a large Silky shark eat most of a bait but managed not to eat the hooks, frustrating to say the least. However, Jeffery and the boys still had a great time. We did manage a nice Barracuda at the end of the trip but it was our only boated fish. Both days were calm seas and semi sunny skies. On a humorous note, Jeffery brought his own “tilt alarm”. Now, there is no such thing as a tilt alarm for when the boat rocks and there were some swells that second day. Jeffery’s youngest Will was not happy about the rocking and went off each time the boat rocked. The minor moral victory was had when Will, who wanted to go in at first, was disappointed that our time was up and made dad promise to do this again. It’s not always about what you catch, family fishing trips are about family time and having fun. Something we try and do each and every trip. Sometimes it’s about the ones you miss or that get away. That’s where fishing stories come from. In our picture today you see Landing holding his BIG fish. 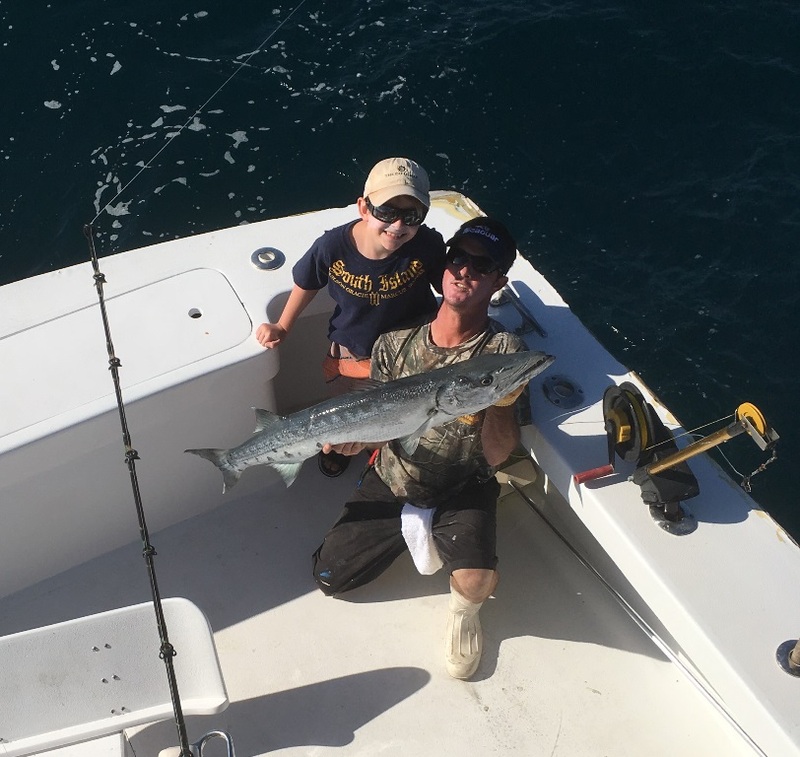 This youngster came on board with his dad, Jake and Danni and ALL he wanted to do was catch a BIG fish. With kids, excitement is always abundant and while this might not be the biggest fish he will ever catch, to this point in his life, this one takes the cake. This Greater Amberjack put up quite a fight and took almost 30 minutes for Landing to land. I grew up in the Chicago area. As a youngster I remember trudging through snow that was waist deep, much as some of you reading this are doing right now. The thing is, as I grew and got taller, the snow never seemed quite as deep as it did just a few years earlier. At the time, it didn’t occur to me that it wasn’t the snow that was less deep, it was me getting taller. The same can be said about our young angler here. He had trouble holding this fish by himself so Freddie was happy to help. Besides, he was quite spent from his battle. He also had to stretch his arms almost completely to see just how long it was. Now we all know that as we grow, so do our body parts and what once was an accurate measurement will now be exaggerated in years to come. And so it begins, a simple form of measurement becomes our introduction to increasing size and weight of our catches! And we end up with our BIG fish story! OK, maybe that’s not how it starts. After all, you can’t lie about size when it hangs on your wall. Only the ones that get away get that privilege. Merry Christmas and a Happy New Year from all of us at Fanntastic Fishing. Well, right now Fort Lauderdale is experiencing some great weather and some very good fishing. With our daytime highs in the very low 80’s and abundant sunshine, that alone is what you want for any visit here. And should you take advantage of our ocean, you’ll be pleasantly surprised in what we are catching. As expected, Dolphin have been being caught. On shore winds have brought these fish in closer to shore and they are enjoying he feast of Ballyhoo and Flying fish for bait. Most have been smaller fish with a few “gaffers”. But it is always nice to have them around and we hope for more to come. While we are still doing some trolling, most fish are being taken on live bait. On days when the winds are blowing, kite fishing has had excellent results. Sailfish are the intended target but Dolphin and Kingfish have also been joining in. A few sharks as well have shown up. Just a few days ago, we caught the smallest Bull shark I’ve ever seen at about 4’. Quite a feat on the light tackle we were using. The Sailfish have been spread out in the depths. The best range recently has been between 100 and 200’ of water but we had one on inside the reef yesterday and a few have been caught outside 400’ of water. The picture we have today has Captain Adam on the left. When he is not working the drift boat he is my deck tech and an excellent one at that. And when you can get 6 people behind one Sailfish? You know it’s a big one! We had 5 shots at Sails that day and only caught this one. It is not always game, set, match when they bite. 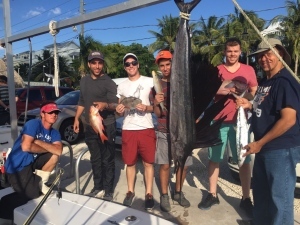 Great weather and very good fishing is what this Fort Lauderdale fishing report is about. I, for one, hope both continue. With our first cold front plunging temperatures into the mid 70’s… I know, not much of a cold front unless 90’s have been your norm… we have had some great fishing! Cooler sea temps have giving us better action on the surface baits and with that? Live bait and flying fishing kites has become the best fishing technique to produce bites. Sailfish, Dolphin, small sharks and Kings have all been attracted to the surface to eat. And as we get further into our cooler months, this will improve. Kite fishing has been around for a long time. The idea behind it is live or dead bait supported on or near the surface. When fish feed, they chase baits up through the depths to the surface where it is easier to catch. The kite takes care of step one. It is also nice to “see” the bite. Many times you can see what’s been attracted and lately, that has been Sailfish. 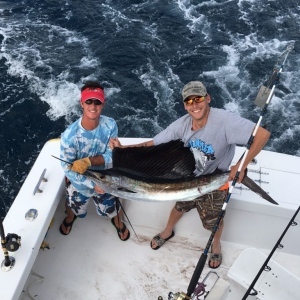 Sailfish is one of the most fun fish we catch for sport. They are strong, acrobatic and absolutely phenomenal in their ability to elude capture. They don’t know we intend to release them, their edibility is poor. Being the Florida State fish, a sport fish and somewhat endangered, we try and release them. It is rare you will see one hanging at the dock anymore unless we cannot revive the fish at sea, as we have in the picture today. These bigger fish fight very hard and expend lots of their energy. Landing them quickly helps us to revive them. This fight took over 40 minutes. Small Kingfish and some Dolphin have been filling in some of our time as well. If our history of the last few years runs true, expect more picture of some nice sized Dolphin as well. December and January have been excellent months for these fish the last 3 years or so. Bottom fishing has also been good. Mutton Snappers, Yellowtails and Amberjacks have been biting both deep and shallow. So what will today bring? We never know. But we’re ready for whatever the fish gods offer. Come join us. The Fort Lauderdale fishing trends are changing as we speak. Just moving that sun a bit south and the shortened days have already had a profound effect on the water temperatures. Because of the cooler water, the fish are more apt to feed in the higher areas bringing live bait into the picture. And we have tons of live bait around right now. With the recent windy conditions, we have had some choppy seas. Waves break up the reflection of sunlight into the water and this allows more freedom for feeding fish. Our trolling days are becoming less and less and live baits are becoming more productive. Sailfish have already been showing up with some consistency. They have been feeding mostly on flying fish and Ballyhoo. 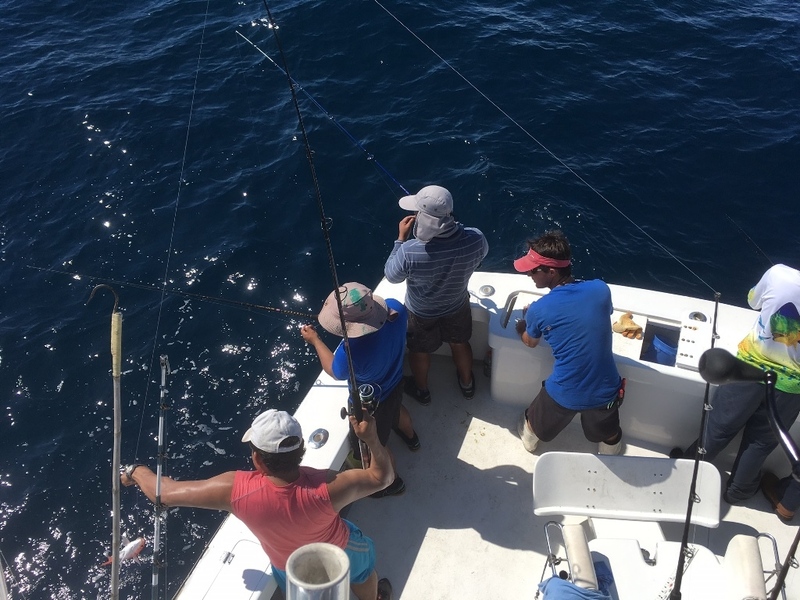 Just a few weeks ago they would barely touch a live bait but the Fort Lauderdale fishing trends are making live bait the way to go. So if a Sailfish is on your list of things to catch, you might consider investing in a dozen Goggle eyes, with the wind, the kites will be flying. Large Kingfish are also in the mix. I have one picture here with Captain Jimmy from our drift boat, the Lois Ann. This was the biggest of 8 he caught the other day along with some snappers off the bottom. It is impossible not to have a great time fishing right now. Coming back from 2 days off to find the fish snapping was a great surprise. While the Kingfish on the reef had been biting well, Dolphin and Sailfish have joined the mix and with some numbers! And trolling has been the most productive. The winds have been from the northeast, our best fishing wind and seas have been running around 3 to 4′. It’s been a little choppy out there but the good fishing certainly makes up for it. Even after doing this for over 40 years, I am excited and having a great time fishing not knowing what the next bite will bring. 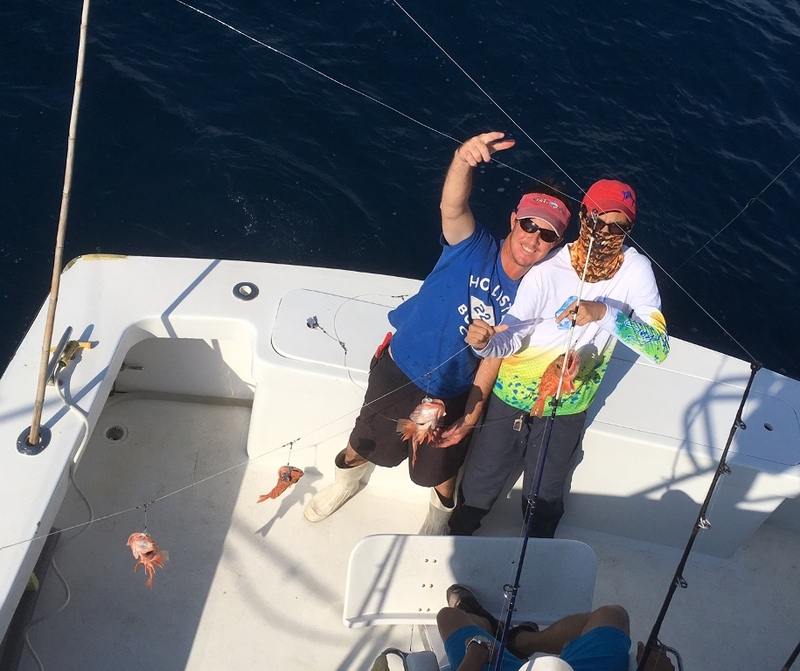 Our guests are just happy catching fish the entire trip without much waiting. And the best part is the action once the Dolphin or Sailfish bite. You aren’t just reeling in a fish that you don’t see till it is boated. You are getting to see him “air out” when he jumps! And most do just that. Dolphin jump almost every time and Sailfish? Well, they can fool you, they might jump on the hook up or they might wait for some time into the fight before showing themselves. And my favorite is when they wait till at the boat just 10′ or so away and come shooting out of the water. You go from knowing you’ve got something big on to OMG! Have those cameras ready, it’s a pristine Kodak moment! All I know is you will have a great time fishing right now. The bite is on and I can’t wait to get back out there!